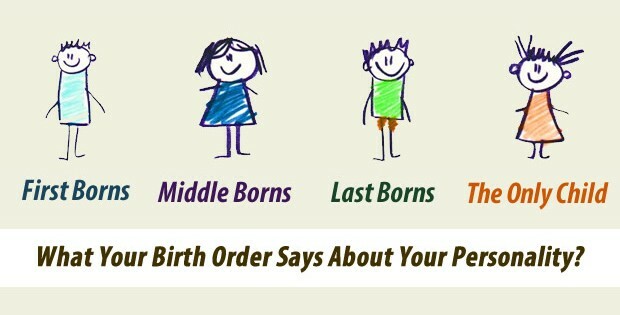 Your birth order can really affect your personality. We all are more or less familiar with these common 4 stereotypes when it comes to birth order personalities:the only child always have trouble in sharing his or her feeling, the oldest child is always bossy, the youngest ones are naughty and spoilt and the middle – well the middle is stuck in the middle. Let us now look closely at each birth order along with typical characteristics associated with them. Firstborns are natural leaders. They are often looked up to by others, and as a result, automatically take on a role of leadership. Parents are often the most strict with first-born children, and expect them to “set an example” for younger siblings. Be reliable, conscientious and perfectionists who don’t like surprises. The oldest child feels the most pressure and have more goals to meet. They are seen as being the least likely to travel or be physically daring. Middle children are like stuck in the middle. They often believe their elder siblings are given all the advantages and that the babies of the family are spoilt and given extra attention. However, being “stuck in the middle” often results in these individuals being skilled at compromising and getting along with others. They can usually read people well since they are used to dealing with both elder and younger ones. Develop skills or talents not shared by siblings- for example, if an older sibling is a star athlete, a middle born child may focus on music for their talent. They tend to not openly share their thoughts or feelings. Be outgoing & socialize well, they can also be manipulative sometimes. If you are an only child, you probably feel the pressure to achieve. As a result of gaining undivided attention from parents, only children are often considered to be self-centered. They are seen to be more in nature than other.